It’s been around for a while and it’s well known but, you know, the newest Kindle really rocks! The biggest and latest e-book gear from Amazon now relies on international wireless support, so you’re never out of touch when it comes to getting new content and e-books (even outside the USA). Amazon recently started exporting the Kindle to other countries, so you can buy one and use it wherever you are! Amazon struggled to negotiate deals with European carriers, which was one reason why the Kindle was not already available to the European market, so instead, the Kindle roams from the AT&T network. The features are fairly similar to those available to American customers. One can subscribe to and download newspapers, magazines and buy and and download books. 1. Amazon’s 130,000+ Kindle-format books are priced around $9.99 (some higher or lower). 2. Built-in wireless (called Whispernet) downloading is also free with purchase of the Kindle. 3. Form factor: the unit is shaped something like a book and is tapered on one side to make it easy to hold. The machine does make it very easy to read for long periods of time without the fatigue you get in your hand from holding a book open and up while reading. The two major upsides to eBooks are presently: generally lower cost and ease of transportation. Book addicts like us can literally carry hundreds of books in a unit the size of a typical small paperback. Another benefit that may not be obvious at first is privacy. How many times have you found yourself in a waiting room, an airplane, or other public places and wished those around you could not see what you were reading? The 9.7” e-ink screen (no backlit or LCD) provides a pleasant reading experience. At first, we were afraid that some documents wouldn’t be as readable due to the fixed format of PDF. But thus far, the Kindle DX seems to solve this very elegantly. Getting a PDF documents on the device is as easy as you’ve come to expect. Just hook it up on your PC using USB, copy the files and you’re good to go. The amount of storage is amazing. you can practically put your entire library on there without running out of space. It also has a very long battery life. We’ve been using it for about two weeks now and so far did not have to recharge the battery. If you want a 2001 H.A.L. relationship with your Kindle , check the Read-To-Me Feature! With the experimental Text-to-Speech feature, Kindle can read English newspapers, magazines, blogs, and books out loud to you, unless the book’s rights holder made the feature unavailable. You can switch back and forth between reading and listening, and your spot is automatically saved. Pages automatically turn while the content is being read, so you can listen hands-free. You can choose from both male and female voices which can be sped up or slowed down to suit your preference. In the middle of a great book or article but have to jump in the car? Simply turn on Text-to-Speech and listen on the go. 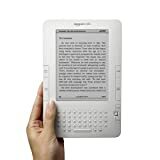 The Amazon Kindle goes for US $ 259.00 right now, happy reading! Kindle 1st-gen - now refurbished for less than US $ 150! Holding over 200 titles, the original Kindle 1st-gen is still edging the competition! 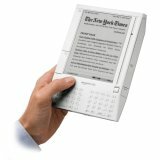 Utilizing a new high-resolution display technology called electronic paper, Kindle 1st-gen provides a crisp black-and-white screen that resembles the appearance and readability of printed paper. The screen works using ink, just like books and newspapers, but displays the ink particles electronically. It reflects light like ordinary paper and uses no backlighting, eliminating the glare associated with other electronic displays. As a result, Kindle can be read as easily in bright sunlight as in your living room.The screen never gets hot so you can comfortably read as long as you like. What about content? The Kindle Store currently carries more than 300,000 books plus newspapers, magazines, and blogs. Get the Kindle 1st-gen now for less than US $ 150.00! Amazon Kindle is an electronic book (e-book) service launched in the United States by Amazon.com in November 2007. 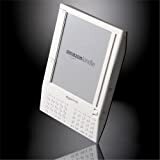 It uses an electronic paper display, reads the proprietary Kindle (AZW) format, and downloads content over Amazon Whispernet, which uses the Sprint EVDO network. This means that unlike previously existing e-book readers, the Amazon Kindle can be used without the need for a computer. Whispernet is accessible through Kindle without any fee. On the release day, the Kindle Store had more than 88,000 digital titles available for download. The Amazon Kindle isn’t the most elegant looking gadget ever created (in fact it looks like it came out of the 70’s), but it packs an impressive list of features and could finally bring ebooks mainstream. Amazon isn’t supporting the industry’s open standard around eBooks. Instead they are using their own proprietary format from Mobipocket, a company they acquired in 2005. A notice on the Kindle pages on the Amazon web store said “heavy customer demand” for the device meant it would be out of stock until 3 December.